As a dietary supplement, take one Vcap 1 to 2 times daily, preferably with meals. Now Policosanol is a blend of long-chain fatty alcohols (LCFA) derived from sugar cane, a superior source of these natural plant waxes. Non-clinical studies have shown that the fatty alcohol constituents in Policosanol possess considerable antioxidant activity, can protect serum lipids against free radical attack, and support healthy immune function. 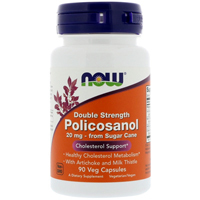 Policosanol can support cardiovascular health through these and other mechanisms. Vegetable polysaccharide (capsule), maltodextrin, organic brown rice flour, magnesium stearate (vegetable source) and silica. ** GMP 마크 가 품질을 보증 합니다. Contains no salt, yeast, wheat, gluten, soy, milk, egg, shellfish or preservatives. Vegetarian/Vegan Product. 않은 채식주의자 도 드실수 있는 제품 입니다.